The holidays are about tradition, family, love, laughter, and, of course, great design. So many of us struggle to balance tradition and design, and the end result is often unedited and cluttered. Minimize the clutter and chose some carefully curated items that add to your home’s beauty while referencing the holidays. Keep your grandmother’s antique carolers, but display them in a classy way. Maybe decorate your Christmas tree with the kids’ favorite ornaments, but skip the inflatable characters in the front yard. It’s all about balance. Great holiday design will make you feel all the holiday sensations without feeling like the North Pole exploded in your living room. 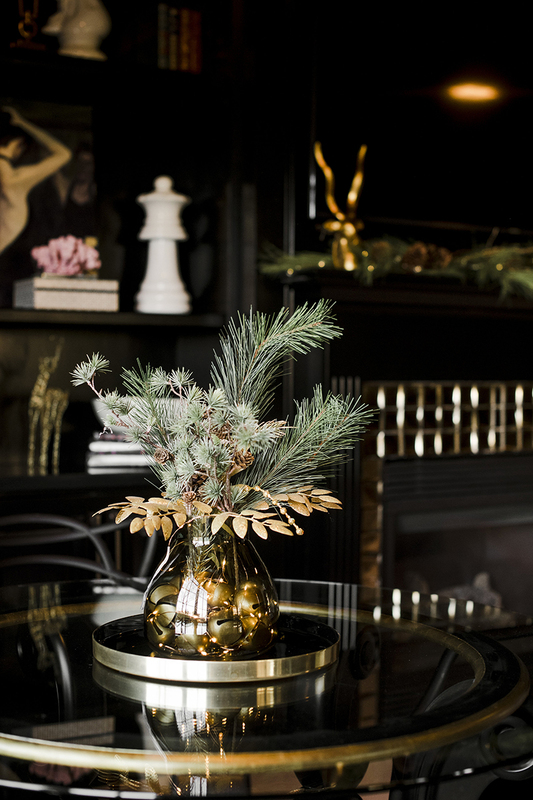 In this Fresno, California home, we took holiday styling to the next level to match the glamorous interior. 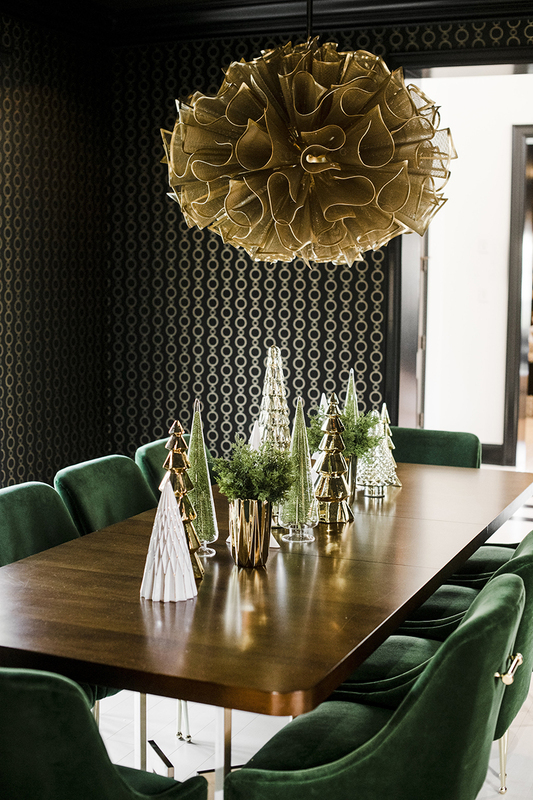 We opted to nix the traditional red and green décor and went all in with golden glitz balanced with evergreen accents. 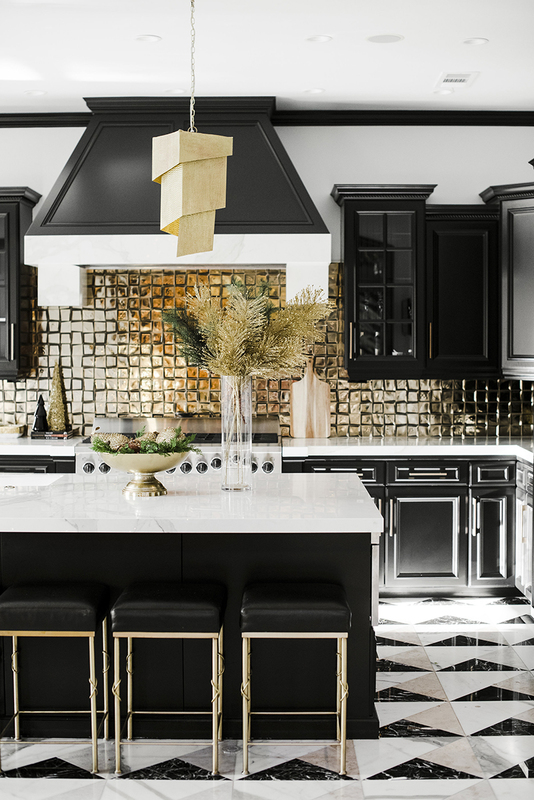 The kitchen, which features white countertops, custom marble flooring, jet-black cabinets, and an over-the-top glam backsplash, needed a simple yet cheerful holiday pop. We used the client’s existing gold compote and clear vase and added jovial greens, jeweled fruit, and glittery picks. The arrangement is simple, using existing items, but oh so fun. 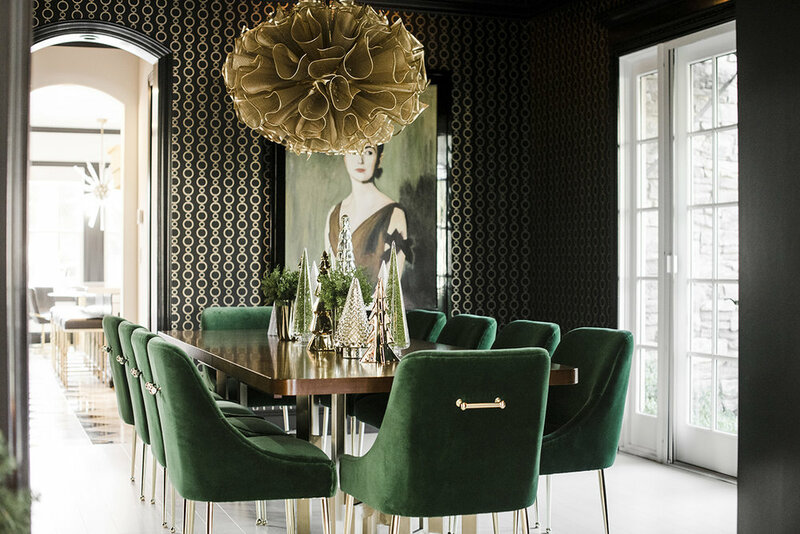 If you happen to have emerald-green, velvet chairs in your dining room, you’re ahead of the holiday decorating curve! Here we continued the gold and green theme and added some glossy, bright white to pop against the black and gold wallpaper. The tablescape incorporates trees with different textures, heights, and finishes to create a modern yet seasonal display. All of the items add to the room and blend seamlessly with the underlying décor—that is the ultimate trick to great holiday design. Now to a very important holiday dilemma… Do we use fake or real? Get your mind out of the gutter—we’re talking about greens! Faux greens are readily available and amazing these days, but you need to pay. Cheap faux is a designer’s nightmare because instead of brightening the space with natural color, they look like drab fire hazards. So, the moral of the story is that if you go fake, remember you get what you pay for. Spring for the best version you can find. They are worth the investment and can be used for years to come. 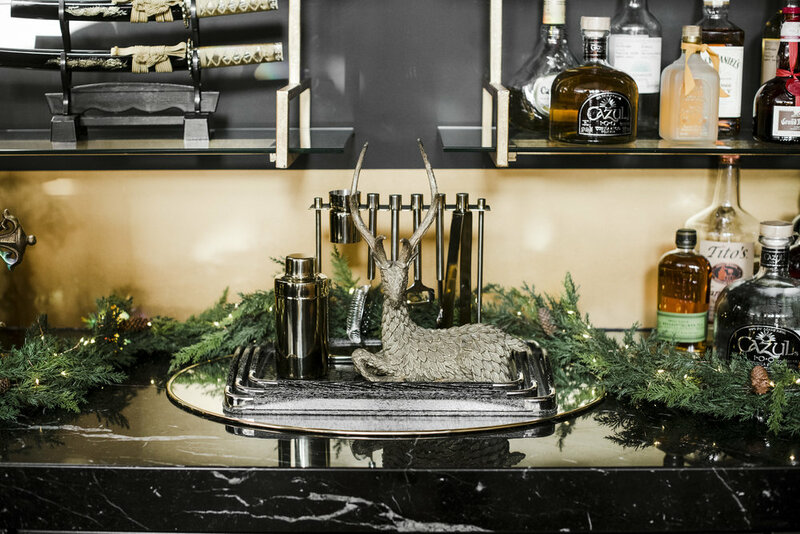 Lastly, don’t miss an opportunity to adorn the space where most of your guests will hang: the bar. Bars are great places to use garlands and add ambiance with LED twinkle lights. The lights disappear seamlessly into the garland, providing a crisp glimmer, and will go on every night, ensuring you’re ready for a party any time!